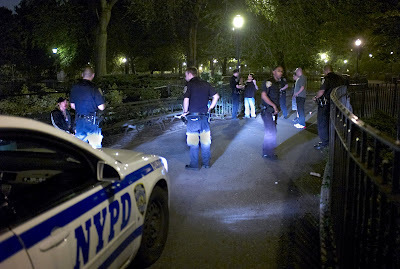 Tuesday night uniformed police were on avenue A and in Tompkins Square Park . Foot patrols were walking the avenue side walk and foot patrols and motor patrols were regularly seen in TSP .No matter the police presence though neither peace nor harmony were possible in TSP . 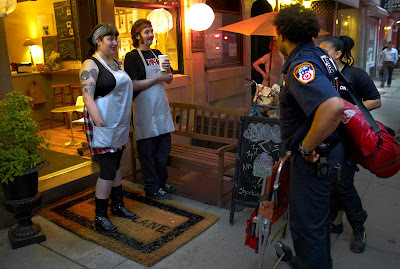 Sometime around 10 PM a heated altercation at the chess tables in TSP turned violent . 2 very animated males were arguing vociferously with the Groper . Tonight she was not groping , just in the males' faces arguing . One of the males punched the Groper in the face producing a bloody nose and a swollen painful lip . Police were called . Several uniform officers arrived at the scene . Suspects were questioned and 1 male was arrested , cuffed and hauled away on assault charges . Its becoming clear that just more police on the street and in the park will not bring peace and harmony to TSP and avenue A . Tonight the additional special help needed to achieve that end though may have arrived . 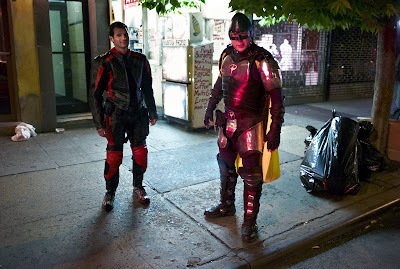 Terrific twosome "Citizen Prime" and "Dark Guardian"made a timely show on avenue A at midnight offering to help fight crime and bring social harmony to the neighborhood . 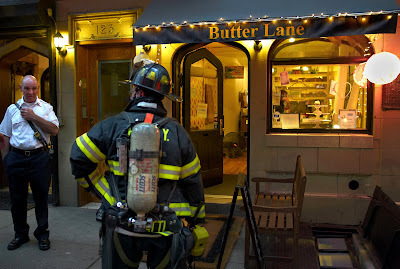 Tuesday evening around 7:45 PM fire department , police and emergency medical personnel were called to cupcake purveyor Butter Lane on 7th street between avenue A and 1st avenue . 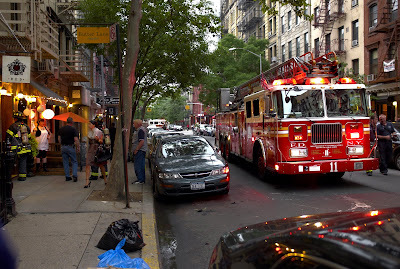 A suspicious chemical odor , possibly gas , and the rescue of apparently trapped individuals was the reason for the call . 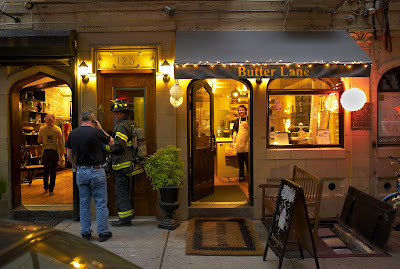 FD found no gas problem , no one needed rescuing or medical care and as far as we know no one received any free cupcakes . 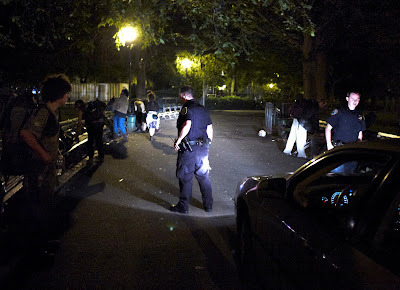 Jimmy Jones angered somebody on a crowded Crusty Row Saturday night , the first night in several without a uniformed NYPD presence in Tompkins Square Park , and in doing so earned himself some injuries including a very large and nasty bleeding gash in his scalp . Certainly there was something of a violent scuffle in the midst of the mostly congenial partying crowd of Crustys and friends . Witnesses' accounts differ with some claiming that he was shoved and fell into a park bench and others claiming that he was kicked in the head . A drunken , stunned and confused Jimmy when we questioned him claimed that he had been kicked in the head . 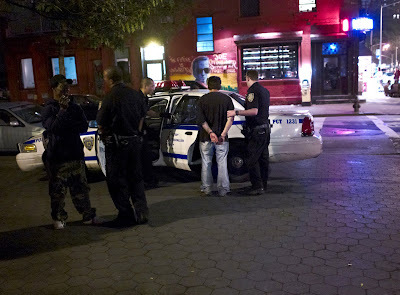 Police , FDNY and an ambulance found him on 7th street in the middle of the block between avenues A and B around 9:30 PM . Somehow he had wandered with swollen , battered face and blood soaked hair draining blood into his his nearly swollen-closed eyes the 300 yards or so to the spot where some one found him and called 911 . 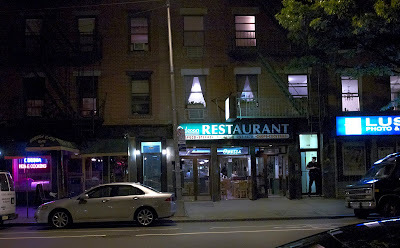 Jimmy was treated at the mid block location and then taken to hospital . We do not know much that is verifiable about what happened on Crusty row or why Jimmy Jones was hurt on Crusty Row tonight . We do know that there were different stories offered by different witnesses .Some of the folks involved tonight were probably also present on Crusty Row the night 4 weeks ago when Lesia Pupshaw and others were beaten . 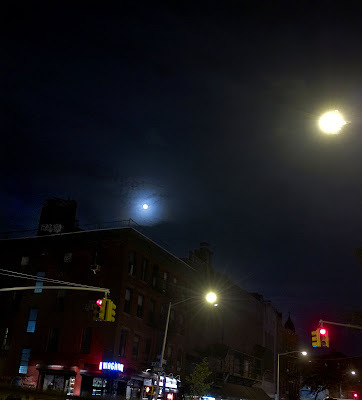 One thing is clear though and that is that the violence tonight was not done by a wilding gang of young Hispanic males from avenue C or D.
Later at 10 PM police cleared Crusty Row .